In seeing Marie Cron's needle felted landscape art, I thought I would tell you about my recent needle felting endeavour. In the fall (October) Ujamaa hosts their finished product sale called "Bags, Babies and Beyond" where a variety of items are made and sold. I attended a workshop to make Norwegian Elves. See my elf, along with a Norwegian lady elf and a wizard. These will be donated for the fall sale. These were needle felted and SO cute. If you check the Ujamaa website, you can see the diversity of sale items made by the Ujamaa volunteers. In the spring (April) Ujamaa has their fabric and yarn sale. 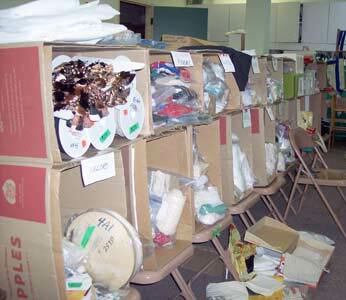 The dedicated volunteers spend 2.5 days sorting the massive amounts of donated items. Often a granny has passed away and the grandkids bring her "stash" of stuff to us to sort for the sale. I have been managing the Notions room for several years now and the key to success is bagging the smaller items and pricing them for either a loonie or toonie. Larger items are priced individually. As you can see from the pictures Ujamaa Notions sorted looks totally different to the Ujamaa Notions mid-sale where a LOT of stuff was purchased. 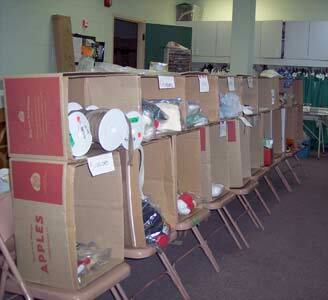 The sales are exhausting, but knowing how much the funds raised help so many, I continue to volunteer. What a great group to be involved in. These sales are incredible, Jennie. Even better because of the cause supported! It looks like a great sale and it benefits Ujamaa and shoppers. I expect that my notions will be in a sale like this someday - I hope they support as worthy a cause!